PeopleKeys today announced the topics for their 2014 DISC for the Real World Online Training series. The company plans to offer one hour-long class every month, each of which will stream live 1pm EST. This series was created to help showcase the many ways that behavioral analysis and an understanding of personality types can be used. Behavioral Selling (January 17): Learn how DISC can be used to increase sales and communicate better with clients. Relationship Recharge (February 8): Strengthen your relationship and come to a better understanding of your partner using new communication strategies. Conflict Resolution (February 7): Learn how an understanding of personality styles can be the key to resolving differences. DISC at Home (April 11): .What motivates your children, spouse, family, and friends? Use DISC to gain insights on the behavior, motivations, and fears of the important people in your life. DISC Ninja (May 16): An intense DISC training class, condensed into a fun, fast-paced, and challenging express session with master trainer John Schindell. TEAMS & Values (June 13): An overview of the applications of two of the most popular PeopleKeys behavioral assessments, the TEAMS Thinking Style Report and Values Style Assessment. DISC Factor—Train the Trainer (July 18): Learn how to facilitate your own DISC training seminar. Teambuilding (August 15): This online training focuses on ways to create strong teams through assembling a strategic mix personalities, and understanding how people think, act, and interact in a group setting. Unlocking Student Potential (September 12): Learn how an understanding of perceptual learning and cognitive thinking styles can help students maximize their study time, retain more information, improve their motivation, and boost their performance at school. Leadership Development (October 18): Bring out your inner leader, and learn how to identify and foster leadership traits in others. Biblical DISC (November 21): Learn how DISC can be applied within churches and personally for faith-based application. Managing Stress (December 12): Identify the causes of stress in your life and learn coping mechanisms based on your specific personality style. PeopleKeys developed the DISC for the Real World series to help showcase the many ways that behavioral analysis and an understanding of personality types can be used for personal and professional growth. The cost of each live, online-training is $49. At the trainings’s completion, you will be sent the training PowerPoint slides. If you do not have access to a PeopleKeys account, just request one at the completion of the training and PeopleKeys will set this up for free. Details and enrollment information for individuals interested in the 2014 DISC for the Real World Online Training can be found on the PeopleKeys website. For anyone unable to attend a live training, previous webinars from this and the 2013 DISC for the Real World training series can be purchased for on-demand viewing. For more information, visit peoplekeys.com or contact Marketing Manager Kaitlyn Miller at 330-599-5580 x113. PeopleKeys is an internationally-recognized leader in the field of behavioral analysis. They have developed a wide variety of testing tools based on a popular method of personality assessment called DISC. 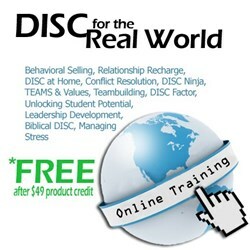 DISC has been in use around the world for over 50 years, and is a simple and accurate way to measure the ways in which a person’s personality can determine their behavior and future success.